But when they returned, she went in for tests. It was September 2000. Although her ultrasound and MRI were negative, her gyno’s nurse urged her to see a surgeon for further work. “She gave me the names of some doctors, but didn’t say much about them. I called one, and when the receptionist answered the phone, saying, ‘Cancer center,’ I was stunned.” Susan’s dark eyes glisten. Over many months, she underwent surgery, chemo, radiation, and reconstructive surgery after her breast collapsed. And then she was done with breast cancer. She was independent, too, one of 21 children (16 girls and five boys, 19 of whom were adopted) raised on a 3 ½-acre farm in Whitehouse, New Jersey, by a woman who adopted babies from Seoul after the Korean War. “When you go through cancer, you don’t have a road map because everyone’s so different.” Susan’s orange socks contrast with her grey slacks. “Maybe it was my own blundering that caused me not to have a map since I didn’t talk to people. I tried to keep cancer at bay by not talking about it. But even after she was in remission, Susan felt blue, in a deep funk. That’s when she visited a clinical social worker who suggested she come to the Cancer Support Community and at least listen to others. She had always been involved in art, sketching, painting, bead weaving, but didn’t take it seriously, despite her mother’s encouragement. In fact, Susan was going to New York’s Fashion Institute of Technology as a 20-year-old mother when she realized she wanted to stay home to raise her baby. Then, she took a job at a law firm—and has been a paralegal ever since. She and her husband, a lawyer, moved to the Lehigh Valley so she could be closer to her mother in New Jersey. “And then, in 2008, I got involved with Lilly Oncology on Canvas,” she smiles broadly. 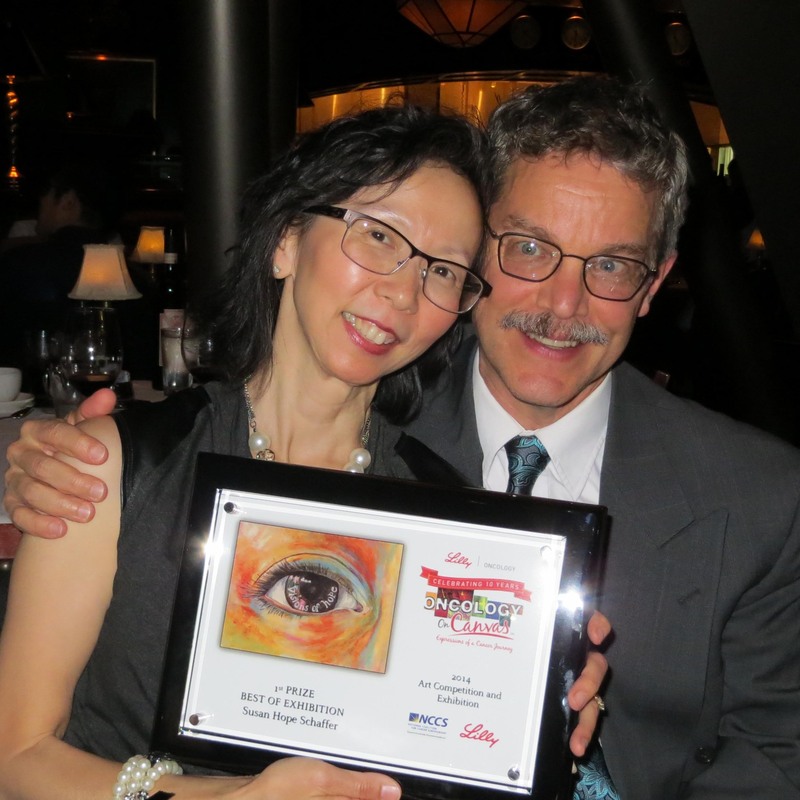 Lilly sponsors artistic competitions by people affected by cancer, and then exhibits them–art, music, narratives—throughout the country. “That year, of 600 pieces Lilly received, my piece, Ripples, was featured among the entries. I was shocked and thrilled.” Two years later, a second piece, Awakening, won the “oil” category, and Lilly not only turned this into a mural at the Fox Chase train station in Philly, but included it in a coffee table book. In 2012, Susan submitted another piece in memory of her niece. While it didn’t win, it also ended up in a coffee table book. But the big win was to come. “In 2014, I submitted Visions of Hope which won the overall exhibit. I was honored at an awards dinner in New York. It was a surreal feeling. But I don’t think this award is about me. This is about a higher reality. I realized that we are all connected; that is our karma. “I decided I needed to inspire people to know that cancer isn’t the end. I began the project, Visions of Hope,” Susan smiles, her even teeth gleaming. This was far larger than one painting. She started interviewing people who had had cancer, and turned their stories into art. “I listen to their words and integrate them into paintings of their eyes. When people talk to me—even though we are strangers—we resonate with each other. They open up and say things and give details that they forgot. It flows out. They let a stranger in. It gave me a feeling of completion. “Each piece I did, and continue to do, was part of my own journey, for none of this would have happened if I hadn’t had cancer. That’s how I know my cancer journey happened for a reason.” Susan settles back in her chair. She has exhibited Visions of Hope at St. Luke’s Cancer Center, Fox Chase Cancer Center, and elsewhere. “A cancer journey forces you to grow, makes you a different person, find a new norm. I am watching myself grow old physically and change emotionally. This woman—the woman who felt like a phony in a support group because she didn’t talk, this woman who shared nothing during her own cancer treatment—found words through her art, and enabled others to speak, also. Susan Hope Schaffer is an artist whose exhibit Visions of Hope recently closed at the Cancer Support Community. Her website is https://www.seoul2soulartstudio.com/oils.html.